It’s Game Day here at spalanz.com, as I try to re-establish the old favourite series of blogs for the month of December. 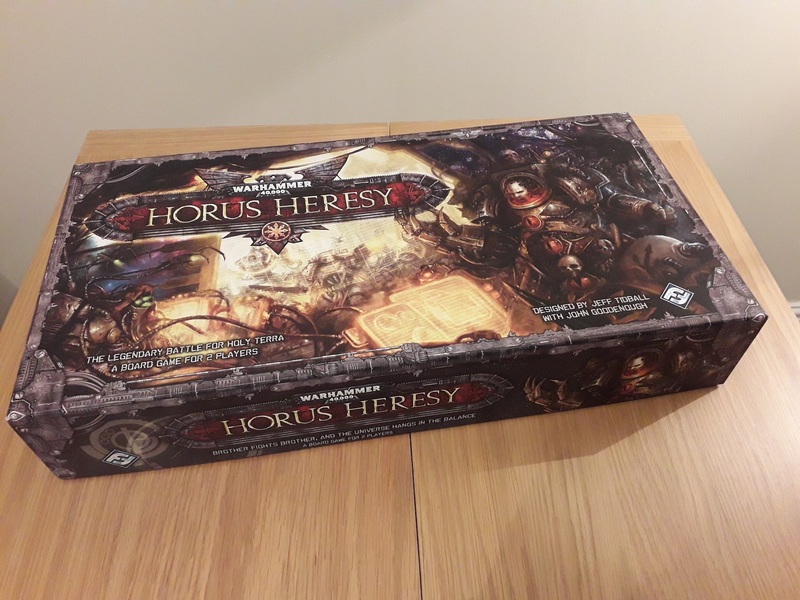 Today, I’m sticking within the now-established theme of being obsessed with Warhammer 40k, and taking a look at possibly the most expensive two-player game I’ve ever bought – it’s The Horus Heresy, from Fantasy Flight Games! This massive box was originally suggested to me by my erstwhile gaming buddy Tony, who was I think intrigued by the lore of the thing, and suggested we give it a go. Well, give it a go, we did, back in 2013, and what an incredible gaming experience it was! I mean that insofar as it was quite the juggernaut of the board game, coming in that huge coffin-box full of cards and miniatures, and of course the 3D game board! I honestly don’t remember a lot of the intricacies of the rules from more than five years ago, and I think the fact we only ever played it once is probably quite telling there. Notably, of course, this game stems from the time before I actually started to build and paint (and play) the GW miniatures, so my exposure to this sort of thing came exclusively in card- and board-game formats like this. The video above does a fairly decent job of explaining the rules, which include card-based combat in the same manner as Mansions of Madness, something I do quite enjoy from a game. I think the main problem with getting this to the table more is the sheer size of the game, though. 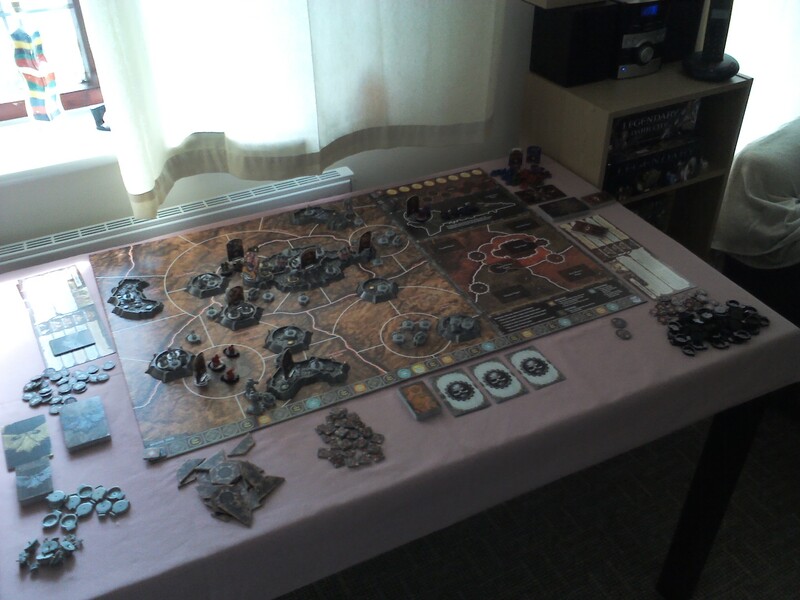 It took me almost an hour to set up before the game (not an uncommon occurrence, as you can see from fellow blogger Roemer’s Workshop, when he took a look at the game!) and pretty much an entire weekend to get the rules straight in my mind. I must say, though, once we got going, I seem to recall it was pretty straightforward to play the actual game. While being no strangers to card-based combat games like this, I think there is still a strange element to playing this sort of game, as we probably just prefer to use dice! Fantasy Flight always make wonderful games, of course, and while the miniature quality is of course nowhere near that of Citadel miniatures, they are nevertheless decent enough for gaming pieces. The Primarchs themselves are cardboard stand-ups, however, which is slightly disappointing, though they do use some classic art, which I suppose isn’t a bad thing! Returning to Roemer’s Workshop, you can get a better idea of the game and its components in his follow-up blog, here. As a board game telling the story of the Siege of Terra, I think the game does a really good job of keeping on-theme while still allowing for the game to actually play itself – you’ll never be doomed to eternal defeat if you play Horus, but you’ll certainly get the sense of what the story is all about. In my game with Tony, I was playing the Loyalist side, and actually lost due to a Spaceport victory (though Horus was on the brink of death when that happened, I’d like to mention!) so it is definitely possible. FFG have, of course, stopped producing Games Workshop games, so this is no longer available. GW have themselves started making their own board games set during the Horus Heresy, although have not yet made an attempt to capture the iconic events such as the Siege. Maybe when the novel series reaches this point, they might? I recently sold my copy on ebay, as it had been so long since I played it, I just couldn’t ever see this game coming back to the table. That isn’t to say it’s a bad game, at all, it’s just a very particular type of game, and I think it somehow belongs to the older Fantasy Flight style of game, when they made things that were pretty heavy-going and gamer-centric, rather than being the more accessible sort of thing they produce these days. But that’s probably the subject for another blog! Next Next post: The Grey Knights, and more!